Before the opening of Highway 180 in 1939, the main route into Kings Canyon was from the southwest, along a rough track through the sequoia forests then down the Don Cecil Trail, which starts from a high point of 8,000 feet at Summit Meadow near Lookout Peak and descends steeply to the valley floor - a drop of 3,300 feet in 6 miles. 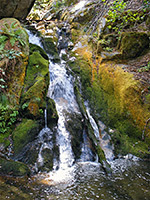 The path was originally used by shepherds (and is named after one), cattle ranchers and early explorers like John Muir, and today is still fairly busy, especially the lower one mile which reaches a series of small waterfalls (Sheep Creek Cascade), tucked away in a cool, forested ravine. The full trail also provides one way to get to the summit of Lookout Peak, though the achievement of hiking 3,800 feet up from Cedar Grove is somewhat diminished knowing that the mountaintop lies just 0.4 miles from Summit Meadow via an easy path, and the meadow may be accessed from CA 198 by driving 13 miles along the unpaved Big Meadows Road through the Giant Sequoia National Monument. 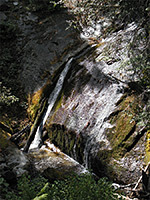 The cascade can be visited by quite an easy hike of less than an hour, round trip. The lower trailhead for the Don Cecil path is along Highway 180 just east of the turning for the Sentinel campground; vehicles can be left at a layby on the north side of the road. The route is not well signposted though easy enough to locate, and starts by climbing through an open forest of large, well-separated pine trees, without any undergrowth. The gradient is gentle at first then increases a little as the path reaches a dirt track (which leads to the Cedar Grove heliport). On the far side, the trees grow closer together, the pines are joined by oak, cedar and fir, and the forest becomes more overgrown, with many fallen branches and decaying logs. 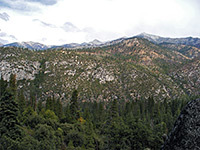 After a while, a gap in the trees allows the first proper sight of Kings Canyon, now 550 feet below - directly opposite is the steep hillside above Cedar Grove, course of the Hotel Creek Trail, while above and beyond are the rocky peaks of the Monarch Divide. The view doesn't last long, as the path descends a little into taller trees growing around Sheep Creek ravine, and crosses the stream on a footbridge. The creek cascades down the hillside over a series of pools and waterfalls, a feature most impressive in spring and early summer, since at other times the amount of water flowing is quite low. The best place is a short distance upstream of the bridge. Beyond the falls, the lesser-used path zig-zags up a ridge separating Sheep Creek from the next drainage westwards, later crossing this stream, climbing the east-facing slopes beneath Lookout Peak and meeting the forest track at the edge of Summit Meadow.